Job opportunities are becoming more and more competitive and positions in the field of psychology are no exception. To gain an advantage you need to respond quickly to potential employers and create a professional profile that catches an employer’s attention. 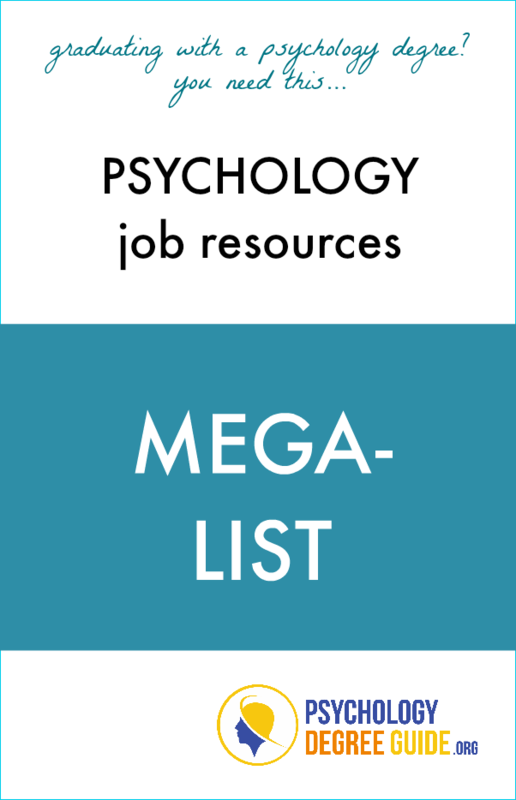 This compilation of psychology job resources has been assembled with the goal of helping you organize and simplify your job search. PsychXChange — PsychXChange is a job board operated by the Australian Psychological Society. You can browse jobs by location and industry. APS members also have access to job alert emails. Society for Industrial and Organizational Psychology JobNet — This site is specifically geared for psychologists interested in the industrial and organizational specialization. Posted listings can be sorted by location for a target search. PsychologyJobs.com — At Psychology Jobs you will find listings for a number of different positions. From schools and clinics to hospitals and private practices, you can get job leads in virtually any field or specialization. SocialService.com — The Social Service Job Website is a compilation of social service positions that is updated frequently. The site boasts that none of the job postings are more than 45 days old, so you won’t have to filter through irrelevant job announcements. Job Science — Job Science does more than just psychology jobs, so you will want to make sure you narrow your search. If you are looking for a job in a clinical or hospital setting, you should check this site frequently. PsychEd Job Connect — PsychEd connects employers with job seekers in the field of psychology. Employers post their open positions as well as search for candidate postings. So take the time to fill out candidate information and double your search efforts. Psychologist Appointments — Psychologist Appointments is a site that offers psychology job listings for England. Click the employer list tab to see the listing of companies currently advertising vacancies on the site. Click on the company website links to do job research before you apply. Psychology Jobs Abroad — This job site lists job openings globally. The list is not as extensive as general US sites. However, if you are looking for work abroad, it can be a valuable too. Jobs in Forensic Psychology — This site is for psychologists interested in law and criminal justice careers. Click the specific job links to get detailed information about salary and minimum education requirements. ResearchGate — A large professional network for scientists, featuring a free jobs board that includes pages for psychology and neuroscience jobs. TheLadders — TheLadders.com lists employment opportunities for many different career fields, including psychology. Their psychology jobs page contains information on average annual compensation, competition and other information useful to job seekers. SimplyHired.com — Simply hired is a general job site. Enter a keyword like “psychology” or a specific job title in the field to narrow your results. Use the “Who Do I Know?” button to help you find employment connections you didn’t know you had. Psychology Jobs on Career Builder — Career Builder has a large number of psychology jobs listed. Make sure you narrow your search by job title or keyword, location, and company to save time. Only search for the most relevant jobs so that you aren’t overwhelmed by the choices. Monster.com Psychology Jobs — One of the helpful features you can use to find psychology jobs on Monster.com is saving searches. You can also bookmark specific jobs. That way, if you don’t have time to apply right away, you can come back to the posting to get all the details. Indeed.com Psych Jobs — Sometimes salary is as important as location. On Indeed.com’s search you can narrow your results based on salary information as well as other more common search filters. Jobs.com – Psychology — Jobs.com is an aggregator of job postings from multiple sites. You might find the site is a time-saving way to conduct your psychology job search. USAJobs.gov — USAJobs.gov is a job listing for government positions in the United States. Several additional resources are available for veterans, students, and persons with disabilities. Employment Crossing — Employment Crossing is a private job listing site. You may find that there are postings for jobs not listed on other sites, but there is a membership fee. You can take advantage of a trial membership to see if the service is helpful to you. Jobs.net – Psychology Jobs — Jobs.net is another site that aggregates job postings from multiple sites. After each listing is a LinkedIn button that helps you find connections with the company’s LinkedIn users. Craigslist Jobs — Craigslist jobs should be filtered by location. While many legitimate jobs can be found on the site, you should be careful of scam postings. Read the site’s help and FAQ pages if you’re not sure how to identify scam listings. Psychology Jobs on TopUSAJobs.com — There may be up to 1500 psychology jobs posted to the TopUSAJobs.com. You can also get tips on the site for posting your resume to niche-specific job sites. Psychology Jobs on Glassdoor — Glassdoor connects you to job postings for psychology too. Simply refine your search to your specific location and look for the most recent postings. Juju Job Search — Juju job search works like most other general job searches. To find psychology jobs in your field, use the advanced search feature to narrow your results. American Counseling Association — Here you can search the American Counseling Association’s list of job leads. In addition, you may find the resume and interviewing resources helpful in your job search. Social Psychology Network — The Social Psychology Network has an extensive listing of psychology job listings and other career search resources. This site is helpful for students, offering advice with resumes and letters of recommendation. American Psychology – Law Society — Jobs at the American Psychology – Law Society are broken down into three categories: academic, professional, and post-doctoral. Other job postings are accessible via the “Other Resources” link. Academy of Psychosomatic Medicine — With the Academy of Psychosomatic Medicine’s job bank, you have the ability to access niche-specific postings. You can also post an anonymous resume to keep your job search confidential. American Academy of Child and Adolescent Psychology — Job Source is the AACAP’s job bank. As a job seeker you can search for openings and post a resume. On the job search page, use the show all option for get a complete listing of openings. American Pain Society — The APS job listings include positions in different disciplines, including psychology. By signing up for an account you can save up to 100 positions to apply for whenever it’s convenient for you. American Psychiatric Association — Job Central of the APA is designed to be a one-stop resource for job seekers. The password protected site lets you create an anonymous resume as well as a personalized website to aid you in your job search. Association for Psychological Science — The Association for Psychological Science hosts this Employment Network site. Be sure to check out the job seeker resources for tips on getting grants and improving your job hunt. Cognitive Science Society — The Cognitive Science Society posts a number of positions in several categories from faculty assignments to research assistants. Email alerts are not available on this site, so you may want to bookmark it and check back often. International Neuropsychological Society — This site includes neuropsychology jobs in the United States and Canada. The listing is small, so don’t let it be your only source for job leads. National Academy of Neuropsychology — The National Academy of Neuropsychology hosts this job database which features neuropsychology positions around the US. National Association of School Psychologists — The NASP offers job listings plus a number of other employment resources. Use the job agent to keep track of the latest openings and connect with the organization on Facebook and Twitter for a chance to expand your network. Society for Neuroscience — The Society for Neuroscience listings let you view current openings and post a confidential resume if you don’t want others to know you are in the job market. Create a personal job alert to get the latest updates. Society of Behavioral Medicine — On the Society of Behavioral Medicine’s job page lists positions in clinical health psychology and other specialties. By viewing the organization’s newsletter, Outlook, you will find additional job opportunities. Society of Biological Psychiatry — Like many other organizational sites, you can use the SBP job center to post a confidential resume and create cover letters. Be sure you check out the resources tabs for career coaching help. Society of Clinical Child and Adolescent Psychology — If your field of specialization is in clinical child and adolescent psychology, don’t forget to keep your eye on the SCCAP’s job listings. Jobs are listed by state for easier browsing. Substance Abuse and Mental Health Services Administration — The SAMHSA job site lists current job openings. These positions are available within the organization; they are not from third-parties. They are federal positions with the US government. American Academy of Clinical Neuropsychology — The AACN lists psychology jobs in the neuroscience field. You may want to set up an alert or reminder to check the site for updates. American Association for Geriatric Psychiatry — The AAGP listings are specifically compiled for psychologists in geriatric settings. Use this site particularly if you are looking for fellowship opportunities in the field. American Psychiatric Nursing Society — The APNA CareerLine can put you in touch with employers. Additional job-seeking info is available on the career page including eNewsletters and event networking sessions. Association for Behavior Analysis International — To gain access to the ABAI job portal, you will need to create a membership account. Accounts are free but require the submission of basic contact information. ABPsi Career Center — ABPsi Career Center is a resource of The Association of Black Psychologists. Check the boxes next to each listing to view multiple listings or add openings to your favorites. Federation of Associations in Behavioral and Brain Sciences — FABBS lists some job openings in the announcements section on their site. Scroll to the bottom of the page for the latest listings. Psych-Recruitment — Psych-Recruitment.com brings job seekers and employers together. To start, enter your profile and the agency will look for openings that match your knowledge, skills, and expertise. Staff Care — Staff care is a headhunting agency that helps people make employment connections in the behavioral health field. Because they specialize in mental health job placement, they can help psychology professionals find a job match. Mental Health Jobs — This job site gives you access to many psychology jobs throughout the United States. In additional, you can also review salary figures to help you find the best job for you. New Age Clinical — New Age Clinical is a staffing agency for clinical professionals including psychologists. Narrow your search by state or browse the full listing for help finding a psych job. Psych Pros — Psych Pros is behavioral health care recruiting site. You can create a profile and get updated career information even if you are not actively seeking a new job. Staff Pointe — Staff Pointe is a recruiting agency that specializes in healthcare positions. Use a keyword search or click on the “Ancillary” link weed out jobs outside of the field of psychology. Delta-T Group — Delta-T Group works like a referral and broker service for health care industry professionals. Psychology job seekers can find positions in the social services, mental health, allied health professions, and addictions treatment specialties. Sunbelt Staffing — Sunbelt Staffing has recruitment connections for school psychologists. For psychologists who need flexibility this could be a good job search tool, because the offer per diem, contract, and permanent opportunities. Mental Health Recruitment Agencies — With this psychology professional recruitment site you can look for work in a number of specialties. They offer permanent positions, so it’s best for psychologists looking for a long-term position. PsychForums — PsychForums is a group discussion board with more than 30,000 members. Active discussions in numerous fields are updated frequently, with hundreds and thousands of posts in individual threads. Psych Central — At the Psych Central forums you can connect with people seeking advice and other psychology professionals. Check out the partner websites for additional resources and career information. Psychology Forum — The Psychology Forum includes discussions geared toward psychology professionals. Check out the Professional & Educational and Counseling & Psychotherapy threads for value feedback from peers. A2Z Psychology — This psychology discussion group includes a thread specifically for job seekers. While there are no specific postings on the site, it is a place for online networking with the greater psychology community. The Paul Rosenfels Community — The Paul Rosenfels Community offers regular, scheduled live chats for different groups. The first chat is for psychology in general, while the second is related to peer counseling. Radical Psychology Network — The Radical Psychology Network is a group for psychologists with common interests in meeting human needs and bettering society. Although the organization started a membership group, there is no longer a formal membership process. Uncommon Knowledge — Uncommon Knowledge is a forum for psychology and self-help. While there is no thread for job postings, there are opportunities to connect with peers in the discipline of psychology. Student Doctor Clinical Psychology Forums — For students of clinical psychology, this forum covers a number of topics related to the field. Don’t forget to check the partner organizations and sites for additional information. Topix Psychology Forum — This is a general discussion site that includes postings from professionals and non-professionals. Be sure to check out the psychology news ticker for the latest news updates in your field. Indeed Psychologist Forums — This forum site for psychologists contains threads about a number of topics useful in job placement and career advancement. Get tips from people already working in the field on things like interviewing and salary negotiation. Mental Health Forum — To make the most of this discussion site, check out the FAQ page first. Once you’ve join discussions relevant to your field, don’t forget to check today’s posts for the most recent conversations. ePsychology — The conversations on this psychology forum target psychology professionals interested in the latest news. General help discussions for professionals in the early years of their career are also available. Frequently Asked Career Questions from SPN — If you have questions about working in the field of psychology, this is a comprehensive resource. Use the information here to help you transition from grad school to the workplace. Marky Lloyd’s Careers in Psychology Page — This page was written by a psychology professional for other psychology professionals. Don’t miss the job resources link at the bottom of the page. Clinical Psychologist Interviews — Landing a job after school can be tough in a competitive market. If you need help developing your interview skills, check out the tips on this page. Psychology Career Changes — If you are looking to make a change or are seeking career advancement, don’t skip this page. You will also find information for dealing with job stress and putting your degree to work. Careers in the Helping Professions — This post from UCLA explains the typical job duties for many different types of psychology careers, such as social workers, marriage and family therapists, guidance counselors and more. SPN Mentorship Program — The Social Psychology Network offers a mentorship program for psychology undergraduates. This type of program can be invaluable for helping psychologists develop employment connections before the search ever begins. Psychology Resource Information System — The Psychology Resource Information System offers information and resources for psychology professionals. There are additional job opportunities and services posted on the announcements page. APA Career Development — The American Psychological Association is one of the largest professional organizations for psychology professionals. The career development page will connect with a number of professional resources for finding jobs and advancing your career. Psychology Careers in Ireland — For those seeking psychology jobs in Ireland, Careerjet offers a comprehensive listing of openings. You can subscribe to new postings via RSS or save your search for later. Psychology Careers in Singapore — Hosted by the Singapore Psychological Society, these postings may be of interest to those seeking an international assignment in the field of psychology. You might find it helpful to check out the information on the organization’s site for other tips and advice. International Recruitment — Align is an international recruitment site that posts openings in the psychology field. Clinical psychology openings can be found in New Zealand, Canada, Saudi Arabia, The Virgin Islands and more. New Zealand Psychological Society — NZPsS offers a listing of job opportunities in the country. You can also get access to professional development, advocacy, and networking opportunities through the association’s site. Psychology Jobs in Canada — This listing of Canadian psycho jobs is maintained by Workopolis. You can filter search results according to location, posting date, keywords and more for a more personalized job search. Pulse Jobs — Pulse is a network of job opportunities available in the United Kingdom. You can get job alerts for a more convenient way to search by RSS, email, or SMS. National Institute of Mental Health — The NIMH has compiled a shortlist of select jobs in the psychology field. Don’t forget to the NIMH postings for job opportunities available directly with the organization. Psychology Jobs in Australia — This site is for psychology professionals looking for opportunities in Australia. However, you can also toggle your search results to include positions open in Canada and New Zealand as well. Chronicle of Philanthropy — The Chronicle of Philanthropy works to connect the people of the nonprofit world. You can create a user profile which allows you to save searches, resumes, and cover letters to make searching for a job easier. American Academy of Psychiatry and the Law — For those interested in mental health and the law, this forensic psychiatry page includes an extensive list of fellowship opportunities. You can get details on the fellowship, the amount of the stipend, and find out where to apply.